I am pleased to announce that, because it was such a hoot in the fall, I will be rerunning my pickling workshop — Pickling Without Pasteur — this spring. Thanks to the Mount Airy Learning Tree, on Saturday May 3rd from 10am to noon, we will be gathering in the Unitarian Society of Germantown‘s kitchen to talk about the biology and methodology of lacto-pickling, and then to make copious quantities of delicious pickles which participants will get to take home in jars. There will be the shredding of vegetables and the mixing of brine. There will be sliced radishes, perhaps of the giant Korean variety. There will be some spicy peppers, but not too many. And as if the opportunity to learn how to do all this stuff were not incentive enough, participants will gain the peace of mind of knowing that they have made happy, comfortable homes in which vast colonies of lactobacilli and yeasts will thrive. 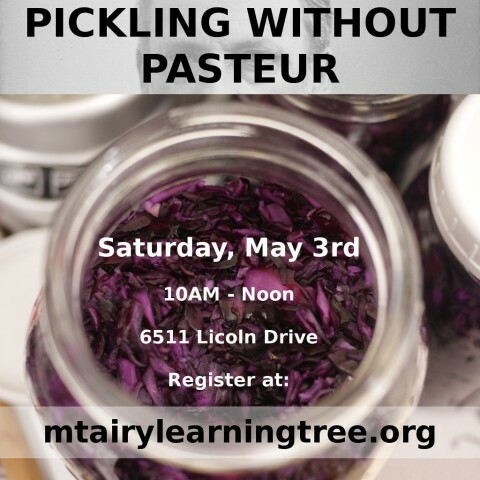 And like I said: Pickling Without Pasteur meets on Saturday, May 3rd from 10 am to 12 pm. It is at the Unitarian Society of Germantown, at 6511 Lincoln Drive. The workshop costs $29.00 for the two hours, plus a $10.00 materials fee. Pre-registration is strongly recommended. And you can sign up here, through the Mount Airy Learning Tree’s website.